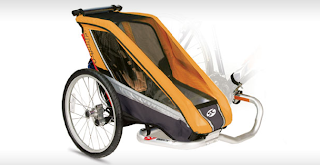 I love the idea of taking a baby/kid with you on a bike ride but I'm not sure when you can take your baby in one of those carriers so this can be filed under way too soon. I'm not really a fan of the bike solutions out there. I do like those trailers that make your bike into a Jury rigged tandem bike, but those are for older kids. And I hate those regular carrier things that look like strollers that you pull...they just seem dangerous. And I'd be lying if I said I didn't almost run one over earlier this summer while pulling out of a parking lot. I couldn't see the freaking thing. Then one day I was reading a magazine, probably Outside...although I was probably inside when I was reading it. Anyway I saw this SideCarrier from Chariot. Yeah it looks like the trailers I just said I hate, but it's a side car. And how awesome is a side car? I'd actually love this one for my scooter but I have a feeling there is some legality/safety issues with putting a baby seat in one. So I'm really geeking out about this. The traditional Chariot trailers have conversion kits so they can transform into running strollers, cross-country ski trailers and more. This one does not but the chances of me running with a stroller is pretty much zero and I don't know how to XC ski so I don't need that option. This is going on the list and once I figure out when you can put a baby in one of these I'll pick one up and report back. Oh and that will probably be some time next summer as the kid isn't coming out any time soon. and that makes this a cliffhanger which will make you want to come back to see how everything unfolds. One little note in case you look into getting one of these. You need to check bike compatibility, I'm hoping mine works. There's one other bike solution I've seen recently. It's a Madsen cycle. Really cool designed bikes, and a website to match...with some nice photos on the homepage. These bikes come in 2 styles; a rack and a bucket. The bucket version has a removable seat and 2 seat belts. Pretty cool, although it could look like you're trucking your kid/kids around in a trashcan. But whatever, I like the design of the bike because of the length and the blue and cream color opyions look nice. Don't think I'll buy one because the next $1300 I sink into a bike will be a cyclocross bike, however I wouldn't mind a free one. You can try to grab one for yourself through the contest they're running now. Check out this MADSEN Cargo Bikes link but if you win you need to let me take the bike for a spin.